Remove suckers and thin raspberry canes. Start to thin gooseberries and established plums and cherries. Mulch strawberries and protect from slugs and frosts. Watch for pests and diseases. As for April, the main task this month is to prevent frosts killing off the blossom and developing fruits. Apples are especially susceptible during May. Use the same frost prevention techniques as described in February. The important point is to remove any covering as early as possible the following morning after the frost has lifted otherwise pollinating insects may not reach the blossom. Weed control is particularly important amongst fruit bushes (currants and gooseberries) and cane fruits (raspberries, loganberries, tayberries, blackberries etc.) and strawberries. Keep a look out for apple sawfly, gooseberry sawfly, red spider mite, caterpillars and capsid bugs, the last three pests will attack most fruits. Spray only if they become a problem. Also watch out for slugs amongst strawberries. Strawberries and raspberries are particularly susceptible to greenfly, which responsible for passing virus diseases from one plant to another. There is no cure for a virus disease (the victims should be dug up and burnt) so a suitable insecticide specific to greenfly must be used at the first sign of an infestation. The other main diseases to look out for this month are mould on strawberries and mildew and scab on apple and pear trees. Strawberry plants that were moved into a cold greenhouse in late February should have fruit ready for picking by the end of the month. Those plants growing in the open garden, but which were covered with cloches or tunnels in February, may also be fruiting by the end of May or early June. Protecting the blossoms of summer fruiting strawberries from frost and continuing to remove the flower trusses from perpetuals (autumn fruiting) up until the end of May. Mulch summer-fruiting strawberries as soon as the fruit appears. Traditionally the mulching is done with straw, to keep mud off the fruit as well as keeping weeds down and the soil moist, but plastic sheeting or special strawberry matting can be used just as well. Scatter slug pellets around the plants at the same time, and continue to protect them from night frosts. If mildew or grey mould has been troublesome, apply a suitable fungicide, according to manufacturer's instructions. During May you can remove gooseberry thinnings from the bushes of dessert varieties, to increase the size of the retained berries on the bushes. Start by removing alternate berries in May and, if necessary, thin again later on if those retained still appear to be crowded. Gooseberry thinnings make excellent berries for cooking. However, remember that culinary varieties, such as 'Careless', should not need to be thinned as the size of the berries is not so important. Established raspberry plants produce many more canes than they need to, so thin them now, leaving about six per plant. Remove any weak, diseased or damaged canes first, and any suckers that have sprung up away from the parent plant. The canes will now need supporting. The easiest method is by using two rows of parallel wires, inside which the canes can be loosely contained or you can tie weaker canes individually to wires, if need be. Newly planted raspberries should be left to grow for the first season, and only the weakest canes removed. Melons sown earlier in spring can be planted out towards the end of May, in a sheltered but sunny spot or, preferably, a cold frame. Provide them with a rich soil and plenty of water. Pinch out the growing tip when six leaves have formed. Grape vines will be producing shoots from the buds left after initial pruning. These will eventually need to be trained along wires spaced 40 cm (16 in) apart or up a trellis, pergola or other support. Apply a liquid fertilizer now and continued feeding throughout the growing season. Any fruit trees which are being grown as cordons, espaliers or fans should be pruned as soon as the new shoots are several centimetres long, by simply pinching out any unwanted shoots. Also remove any shoots that are pointing in the wrong direction, causing overcrowding, or growing towards the wall or fence against which the trees are trained. The time that fruit ripens can vary from year to year, depending to the local weather conditions. 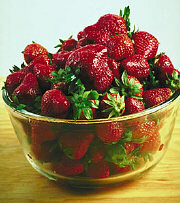 Early and forced strawberries can usually be harvested towards the end of May. Certain varieties of sweet cherry can be picked from the end of May onwards. Gooseberries thinnings can also be picked, before they ripen, for jam making.